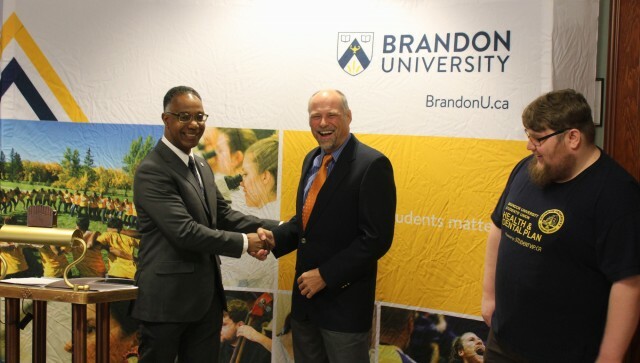 Brandon University President Gervan Fearon (left to right) and Municipal Government Minister Drew Caldwell announce a student family housing complex at BU, along with Brandon University Students' Union Interim President Nick Brown, on Friday, Jan. 15, 2016." BRANDON, Man. – Brandon University (BU) students with families will have an affordable place to call home thanks to a $12-million commitment from the Province of Manitoba. Municipal Government Minister Drew Caldwell visited the BU campus to deliver the good news on Friday, as the province partnered with the university on a $13.5-million project that will result in the construction of 42 student family housing units. “Accessible and affordable housing for students with families is an important factor influencing the decision to attend Brandon University for many people,” said BU President Gervan Fearon. Construction is expected to begin this summer on the project, which will feature a three-storey apartment building, with 16 three-bedroom units and eight two-bedroom units. In addition, 18 three-bedroom townhouse units will be built. Aimed at low- to medium-income students, rent will be based on affordable rates for the area, with rent on half of the units being geared towards the families’ income. Brandon University will donate land, valued at $850,000. Located on the former Fleming School grounds, the development will give residents good access to the nearby university campus and neighbourhood amenities. “Increased affordable housing space designated for student will alleviate the local housing shortage, while allowing low-income students to live close to campus,” said Nick Brown, Interim President of the Brandon University Students’ Union. Fearon said the project is the culmination of years of dedication, crediting former BU President Deborah Poff for initiating the development. He also lauded BU Vice-President of Administration and Finance Scott Lamont, partners including Kirk Brugger, and the efforts of others in the city and province for bringing it to life. 3D rendering courtesy Prairie Architects, Inc.